Why Are the Seeds on My Strawberry Sprouting While Still on the Strawberry? Q: Strawberry Seeds on Strawberry All Sprouting? We have some Alinta strawberry plants but the strawberries themselves are all re shooting from the tiny seeds on the outside of the strawberry itself. What is the cause and what needs to be done? the berry just looks like a green hairy strawberry. I found a strawberry in my patch today with little green leaves growing out of each of the seeds on the skin of the red berry. I’d never seen this before and wondered if there was some explanation. My son inlaw sent me a photo of a strawberry forming fruit but instead of normal berry with seed small leaves are coming out instead can you explain what’s happening? Hi, my strawberry fruit is growing green leaves out of it. can you tel me why please? Answer to: Why Are the Strawberry Seeds Growing While Still Attached to the Strawberry? The phenomenon where the “seeds” turn into green shoots all over the surface of a strawberry is called “vivipary.” Vivipary occurs frequently in some plants, but only intermittently in others, like the strawberry. Viviparous plants produce seeds that germinate immediately while still attached to the plant. So, the achenes (commonly called strawberry seeds) are actually sprouting/germinating right on the strawberry. While this might sound like a great idea, the green shoots emerging aren’t as tasty as the red accessory fruit of the strawberry, and they aren’t as easy to ignore when eating as are the ungerminated seeds. The viviparous strawberry is still edible, however, and can still be eaten if you don’t save the strange strawberry to show around. Some plants, like the red mangrove tree and Poa alpina grass regularly demonstrate vivipary and rapid germination. And, just like the red mangrove and Poa alpina seeds, the rapid germination of Fragaria seeds doesn’t preclude them from being planted and growing normally. 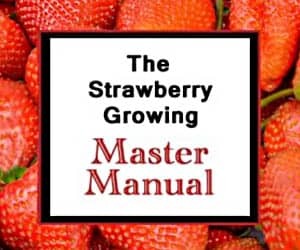 However, each seedling would need to be planted separately for best results as planting every plant springing forth from a viviparous strawberry would cause terrible overcrowding. While viviparous germination in strawberries is not common, per se, it is most common for all or most of the seeds within the achenes of a strawberry to germinate as illustrated above when it does happen. However, in rare instances, a single viviparous germination will occur. Sarah Patterson of the Benevolent Association of Botanists and Biologists (BAOBAB) discovered and photographed the single instance demonstrated to the right. One final note: vivipary shouldn’t be confused with seed germination that occurs quickly but after a fruit is over-ripe. The Jackfruit, some citrus fruits, and even tomatoes have been known to have seeds germinate inside them after reaching a state of extreme ripeness. That is not the same phenomenon. I grew up in NW Ga. My grandmother had a strawberry field behind her house. I was born in 1972. I’m not sure how long they had been there before me (probably a long time). The strawberries were small (about an inch square with a short cone), and they were very sweet (not tart at all). I am planning to grow some strawberries and would like to have that same familiar flavor, but I don’t know where to begin to find them. Any ideas as to what variety was popular in that area during that time? I have a large aquaponic setup and absolutely all of my 60+ strawberry plants outside this winter are almost 100% viviparous. 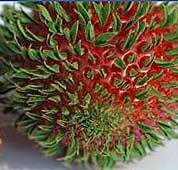 Some plants have say 10+ strawberries all with this condition. Yet the 20 plants in my green house(also a aquaponics system) are mainly OK.
I’m guessing it’s caused by the cold, as strawberry seeds need a cold period before they will sprout. I think this is what’s happening to my strawberries, but the entire fruit is covered with leaves, you can no longer see the fruit. How do we avoid this? It typically will correct itself as the weather patterns stabilize into the spring. The ones that have already sprouted will likely best be used as bird food, unless you like strawberry greens with your berries! Good luck! How are the seeds of the strawberry fastened to the fruit? I’m not quite sure how to answer this other than to say that the genetic encoding for the strawberry calls for biological fibers of accessory tissue to hold the seed-containing achene to the surface of the fruit. Either that, or the sneaky garden gnomes stick them on during the night hours with their magical gnome glue! Hope that helps! Thanks for appreciating my meager attempt at humor! Can I use my viviparous germinated strawberries to re-grow more plants ? if so – how do I do this? to I plant the whole strawberry in dirt? Yes, you can. Carefully cutting the sprouting seed off and potting it in a good seed starting mix should work. Try to take as much of the accessory tissue as possible for each seedling you plant. 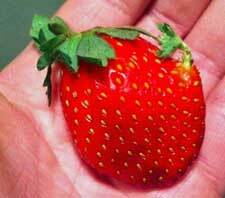 You can also plant the entire strawberry, but the process will likely work better with the seed starting mix. Good luck! If you want to transplant the runners, you can allow them to root first and then snip them away from the mother plant. If you just want the biggest possible strawberries, the runners should be snipped off as soon as you identify them. Good luck! There must be some kind of genetic or environmental cause for vivipary. I was at a hydroponic strawberry farm with my family today, and roughly 10-20% of the strawberries were viviparous. There must’ve been hundreds of them like this. I looked up the phenomenon and found this page, and then discussed it with the staff at the farm. They suggested it was just fruit that wanted to be a flower, but I think that was just convenient short hand. But what makes me curious is why there are so many? Hotter than usual weather? The hydroponic set up? Any ideas? I am not for sure why the strawberries at the hydroponic farm you visited were viviparous. It very well could be a combination of genetic factors and the nutrients in the wash they use to grow the plants. Most likely, however, temperature fluctuations and other environmental factors trigger the phenomenon. Good luck! I have several plants doing this this year. They are the exact plants that I have had for 3 years, but last year I potted them and worked the soil with manure through the winter and now replanted them in the spring. The plants are doing amazing with about 20 berries per plant but I have a high rate of viviparous. I’ve concluded that it wa caused in my case by excessive nitrogen to the plants. Perhaps it is the same for others? I don’t know. I’m not going to pretend I know this for sure, but I have read that strawberry seeds need to be put in a freezer for a while before they will sprout. I guess it makes sense, as this would make them sprout after the winter. Could it be that the weather had been colder than normal? Thank you we have had the same in our strawberry patch this year. I was not going to eat them. But now that I know they are safe for consumption the guinea pigs will probably enjoy them. Everywhere I looked said it had something to do with GMO, herbicide, or humidity. Not trying to sound stuck up but mine were bought organic because I got them at the end of the planting season last year at 50% off. I don’t use herbicides or pesticides because my plants are usually consumed by our guinea pigs too. Finally I live in a desert, so I definitely know it is not the humidity. Yes, they are perfectly safe to eat, if not quite as tasty with all the greenery budding out. The guinea pigs are a great way to dispose of them! Good luck! Thank you for this info. This is happening all over my strawberry patch. My kids thought we had hairy strawberries. If I understand your comment correctly, I think that is exactly what you can expect with viviparous germination! Good luck! Dear friends,If I would like my strawberry to have viviparous germination! Is there a way I could get a few of my plants to develop berries that way! Unfortunately, I am not aware of how to induce viviparous germination. It is somewhat rare in strawberries! Good luck, though! Try spraying them with eggshell solid based fertilizers. I lost my entire first year that way. -_- And no they did not taste good! They tasted really stringy and rough. So take note not to spray fertilizers on them while they’re fruiting. Even a little bit could cause this.